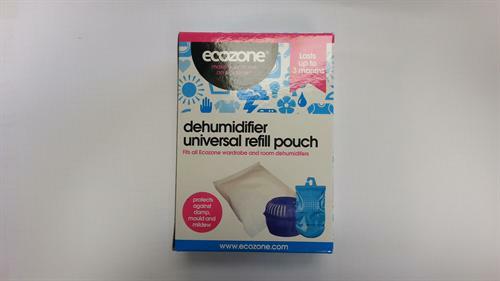 The Ecozone dehumidifier refill pouch absorbs unwanted moisture and damp protecting your home from mildew, mould and musty smells. The innovative no mess bag is easy to use just dispose of the old pouch and replace with a new one. Keep wardrobes at their optimum humidity for up to 3 months with each pouch. Buying this product will earn 54 Loyalty Points. Be the first to submit a review for the Universal dehumidifier refill.